Large Smoothfoam shapes are a great foundation for acrylic mosaics. 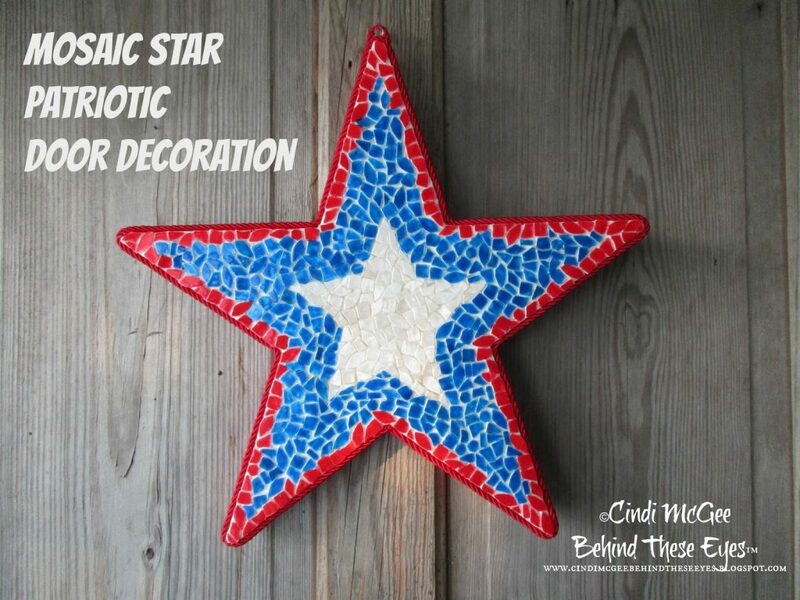 Paint clear tiles in your favorite colors for a fantastic wallhanging like this star I made for the Fourth of July. Visit my blog for all the details. 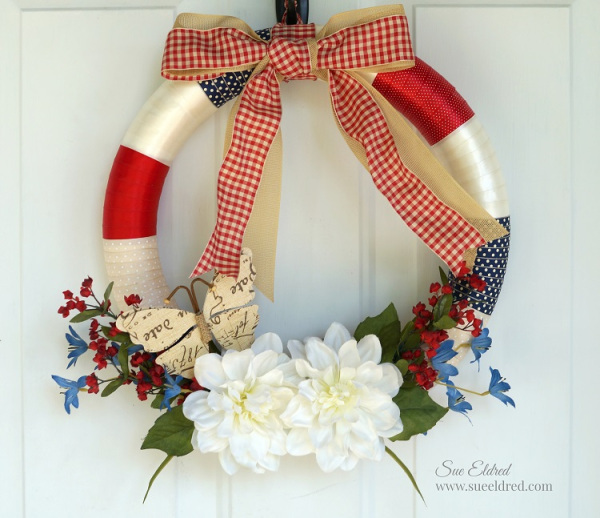 In an effort to spruce up my front porch, I made this DIY Americana wreath to celebrate the 4th of July with a fresh and flowery summer feel. 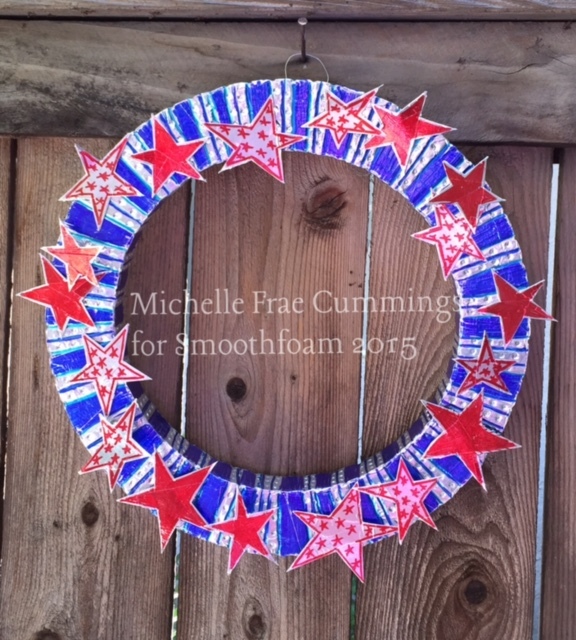 Visit my blog to see how I created this patriotic wreath craft using a Smoothfoam ruled wreath form. 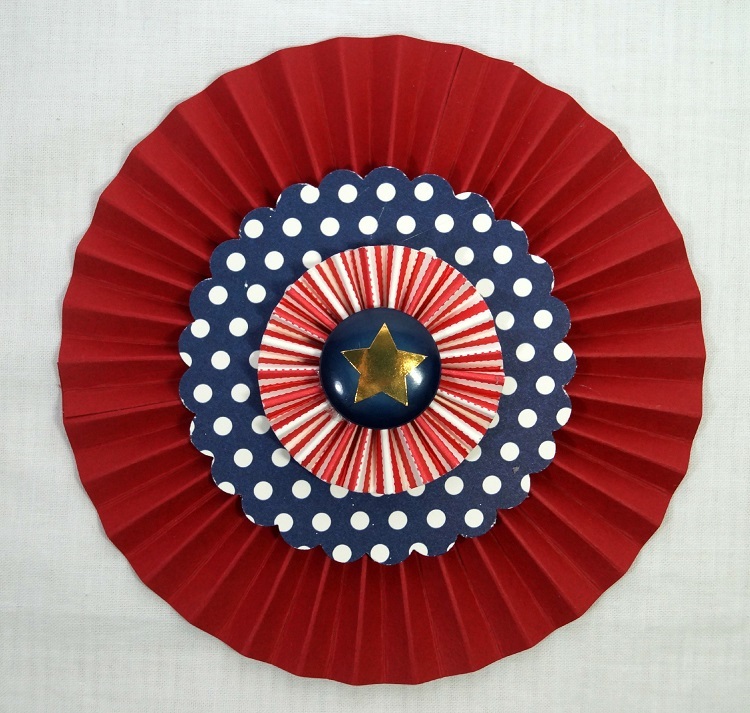 Now’s the perfect time to pick up some stars and stripes novelty fabrics and make a quick and easy patriotic wreath to hang for Independence Day. Head over to my blog to see how I made mine – and then let’s get to marching! Three cheers for the red, white and blue! 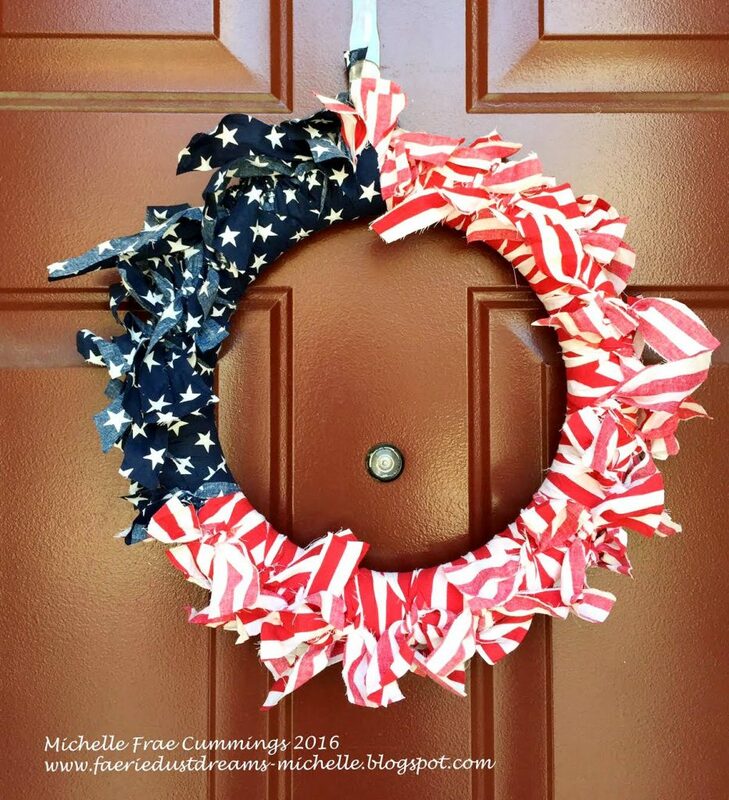 Smoothfoam’s new ruled wreath forms make it easy to alternate various types of fabric strips, so the colors and textures are nice and even all the way around this DIY flag wreath. 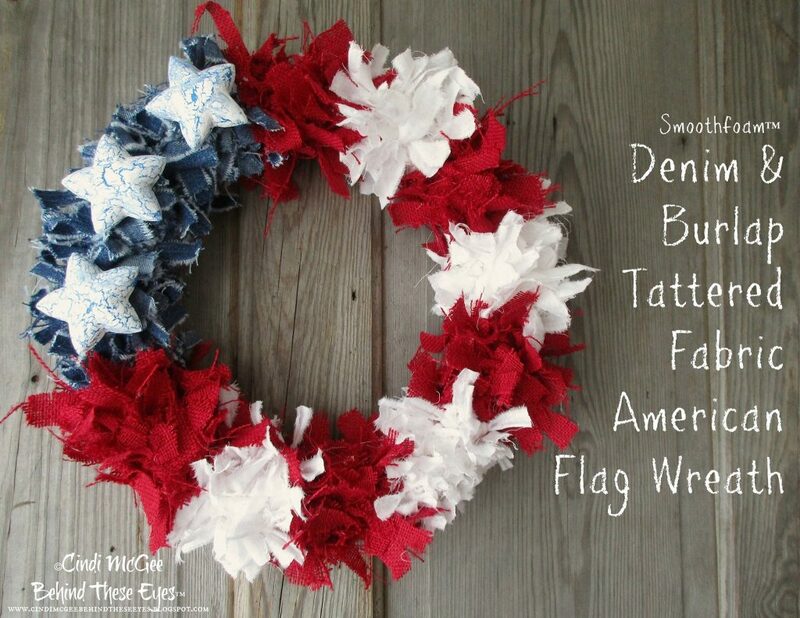 Come over to my blog to learn how to make a denim and burlap American flag wreath using burlap and denim scraps. 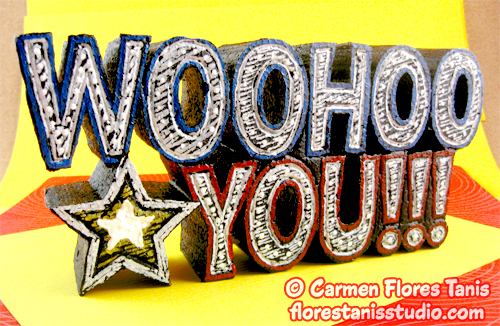 Check out how I distressed the Smoothfoam star shapes, too! 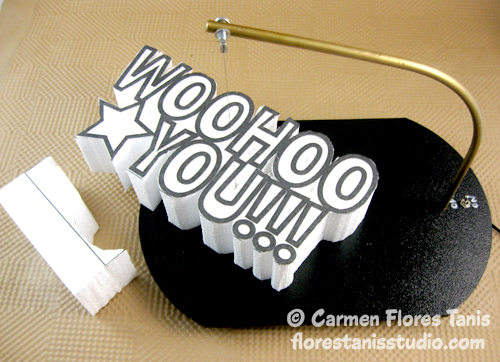 This carved Smoothfoam party sign is perfect for a graduation, birthday, new promotion or any kind of celebration. 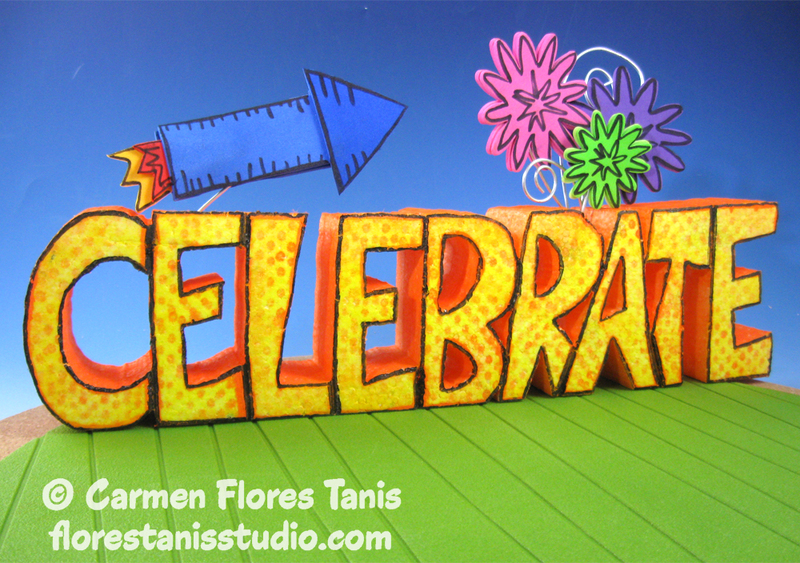 It’s a fun and whimsical way to congratulate the guest of honor on a wonderful accomplishment. Not only does it combine several of my favorite trends right now – chalkboards, marquee letters, word art and Dr. Seuss – but it would also be right at home on your Fourth of July picnic table! 1. 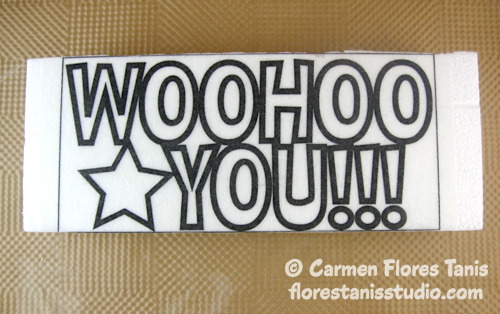 Click here to download* my original “WooHoo You!” artwork and print it out on the Sulky transfer sheet. Trim the Sulky to fit the Smoothfoam sheet. Peel off the backing paper and press the transfer sheet onto the Smoothfoam. Poke pilot holes with the hot knife into each area of the block that will be cut out. 2. Carefully carve out the design on the mini-scroll table. Unthread and re-insert the wire into each pilot hole to make each interior cut. 3. 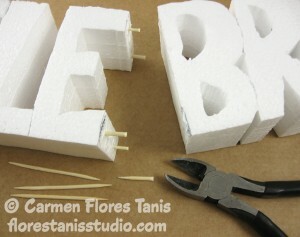 Add textural outlines to each letter with the heat engraving tool. Peel off the transfer sheet when finished. 4. 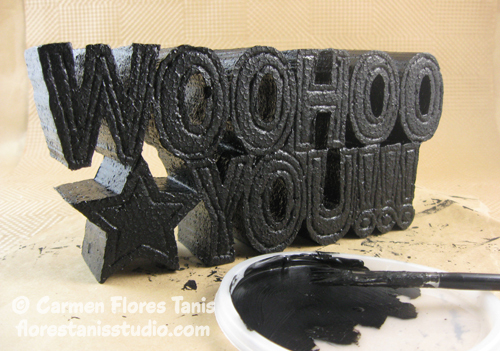 Paint the party sign with black acrylic paint and let dry. 5. Outline and doodle on the letters with the paint pens. 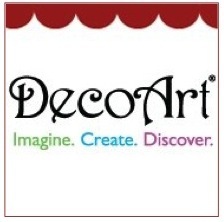 Finish by adding dots and other textural fills with the dimensional paint. * You are permitted to use my original artwork ONLY for your own personal project or a gift/donation. It is a copyright violation to use my original artwork on items you intend to sell. Thank you! Having company over for the 4th of July? 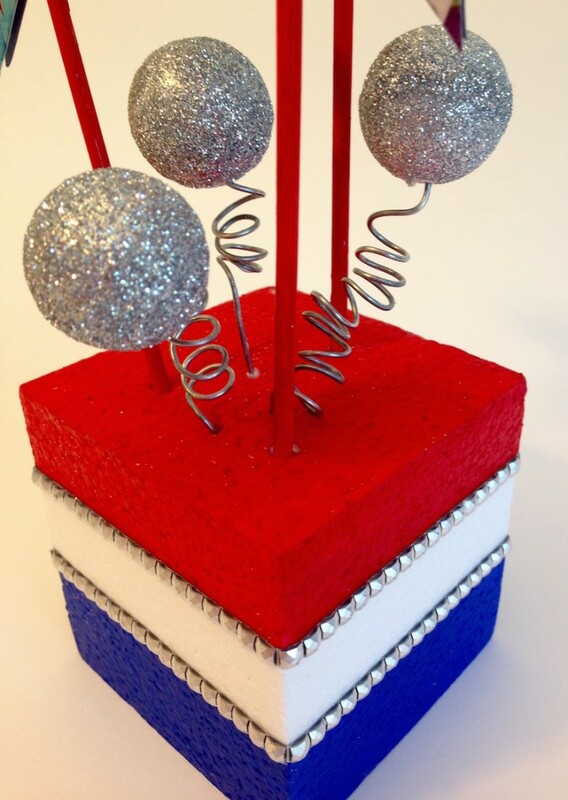 This is a quick 4th of July topiary decoration decoration to make for your table. Adapt it to other holidays by changing the color scheme – pastels for Easter or fall colors for Thanksgiving. 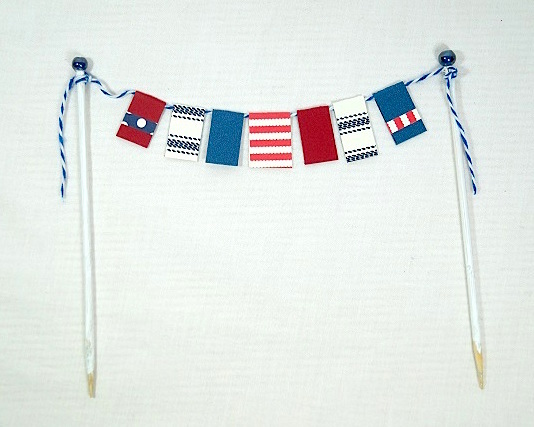 Be sure to check out our other fourth of July decorations! Rub silver Metallic Lustre on to the dowel using a paper towel. Allow to dry and then buff to a shine using another clean paper towel. Punch a hole into the base of the ball and also into the center of the cube with a knitting needle. Paint the cube red and allow to dry. Insert the dowel between the curbe and the ball. 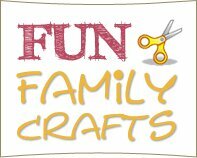 Cut a 5″ length of ribbon, roll it into into a cylinder and pin it to the ball. You may need two pins for wider ribbon. Repeat this procedure, randomly placing the colors until the entire ball is covered in ribbon loops. Cut 12″ of the silver ribbon, tie it into a bow around the dowel just below the ball and trim the ends as necessary. Cut a 12″ piece of blue ribbon and pin it around the top of the cube. Cut another 5″ piece and form a loop with the edges overlapping and glue the edges together. Cut a 2″ piece of red ribbon, fold it over the center of the blue and glue the ends in place to make a bow. Pin the bow to one side of the cube. Pin sequins across the surface of the cube for a little extra sparkle. It’s summertime! That means 4th of July is almost here – time for block parties, community parades, and barbecues with family and friends. 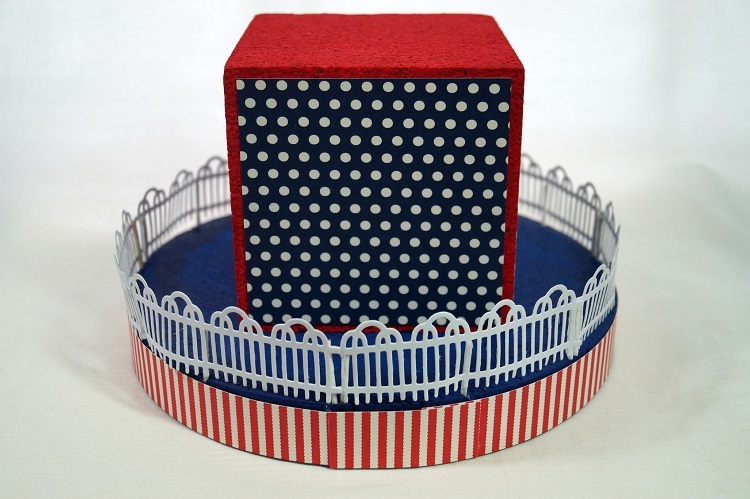 Smoothfoam cubes make the perfect foundation for crafty, star-spangled party decorations – this project will fit nicely on a small table. This project is really fun to make with a little paint, a little glitter and whatever imagery you like. I prefer printing on the Craft Attitude film to get nice crisp images that will last longer because the ink is sandwiched between the film and cardstock you glue the film to. The film helps images look great on textured cardstock, too. But as an option, you can print your images directly on to smooth cardstock. 1. Wrap a strip of painter’s tape around the center of the Smoothfoam cube and press it firmly in place. Paint the top of the cube red and the bottom of the cube blue. Carefully remove the tape and let the cube dry. 2. Place each Smoothfoam ball on the tip of a skewer and brush a generous amount of tacky glue smoothly across the whole surface. 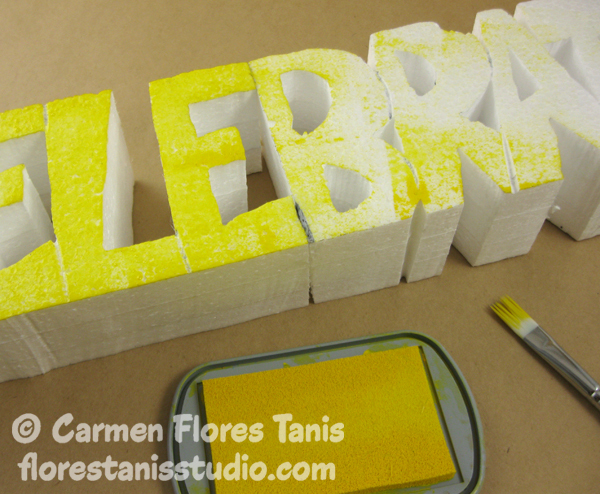 Quickly sprinkle glitter to coat. Poke the skewered balls into a scrap piece of Smoothfoam to dry. 3. Print your desired images in reverse on to an 8.5×11 sheet of Craft Attitude film, following the manufacturer’s directions. Click here to download a PDF collage sheet of the vintage images* I used. 4. It’s easiest to apply the film to an 8.5×11 sheet of cardstock a little bit at a time, keeping the paper backer in tact so you’re not handling the film itself too much. Carefully peel back about an inch of the backer paper to expose a strip of film across the short side of the sheet and press a fold into the backer paper so it’s like a tab. 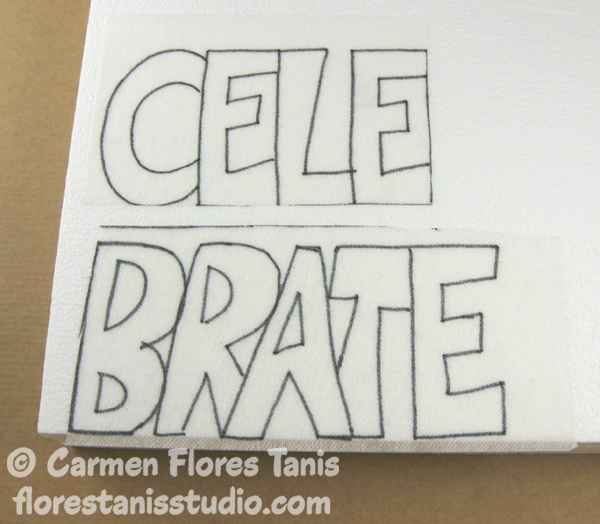 Apply glue stick evenly and smoothly across the top of a sheet of white cardstock. Line up the film (printed side down) and press it down at the top of the cardstock, smoothing out any creases. Apply glue stick to the rest of the cardstock and carefully press the rest of the film sheet into place on top, slowly rolling the backer paper away as you go. Press out any creases and allow to dry for a few minutes. 5. Trace and cut three 3″ wide stars from the cardstock, cropping out the images as desired. Cut 3 more stars from what’s leftover, or from another piece of cardstock. Apply foam adhesive squares near each point and press two stars together, printed sides out. Set aside. 6. Once the glitter balls are dry, carefully twist them off the skewers. Paint the skewers red (leave the bottom inch unpainted) and poke them back into the scrap foam to dry. 7. 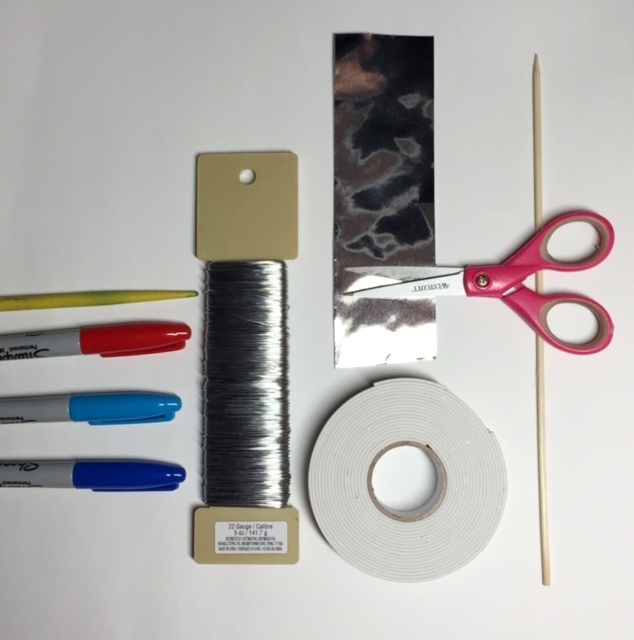 Cut 3 lengths of wire and wrap around a pencil to coil. Bend the ends straight – poke one end into each ball with a dot of glue to secure and poke the balls into the center of the painted cube. 8. Poke the dry skewers into the cube around the balls and slide a star on top of each point. 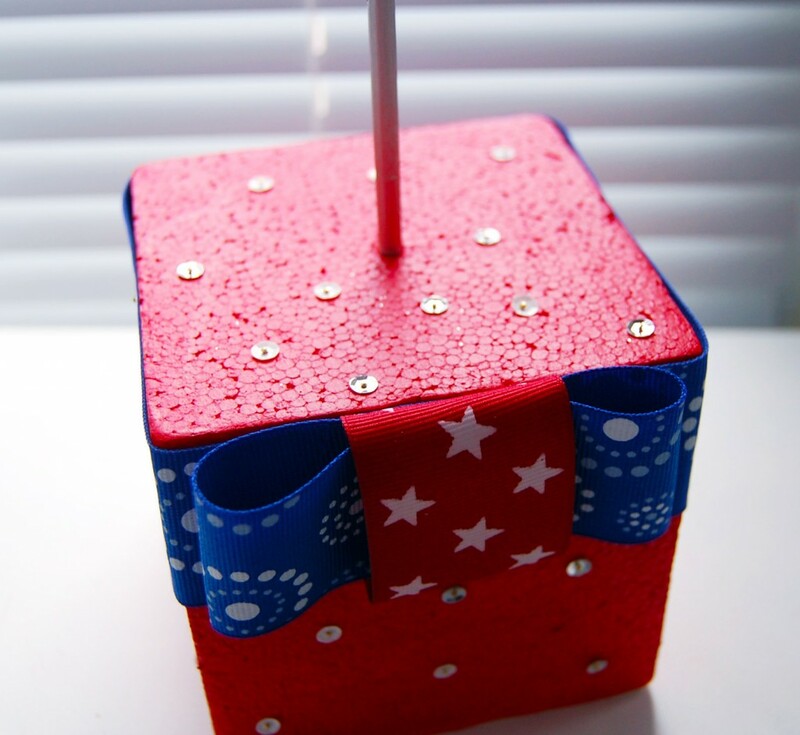 Trim two strips of self-adhesive bling and wrap around the cube to cover the lines dividing the red, white and blue. If the cube feels top-heavy, glue some pennies or large washers to the bottom to weight it more evenly. 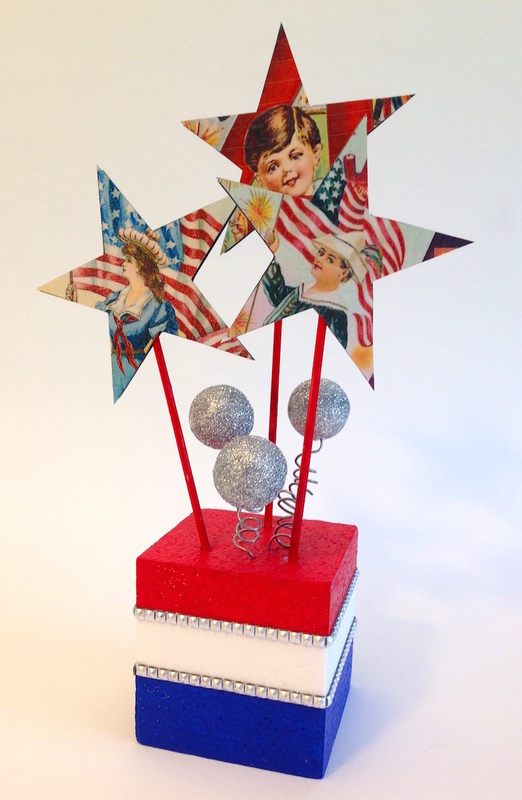 Click here to learn how to make a larger version of this project for a matching centerpiece. * Many vintage postcard images found online are in the public domain and considered copyright-free, however it’s best to be safe and only use them for your own enjoyment, not to resell. 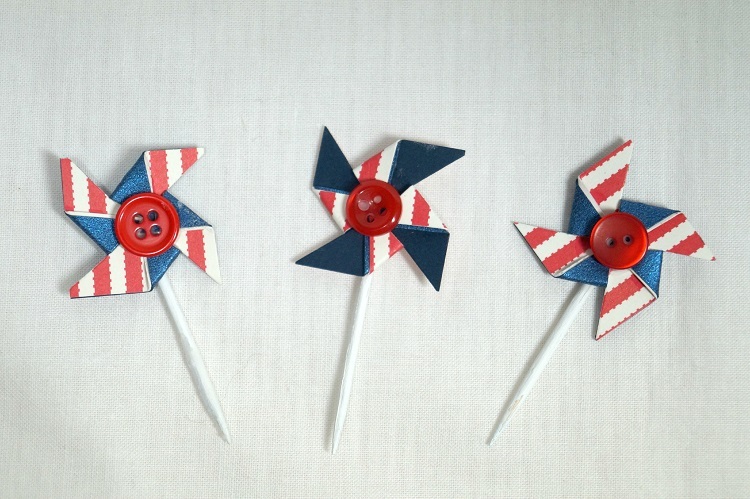 With summer almost here, I thought it would be nice to get a head start on some patriotic decorations! 1. Wrap the edge of the wreath with the foil tape. 2. 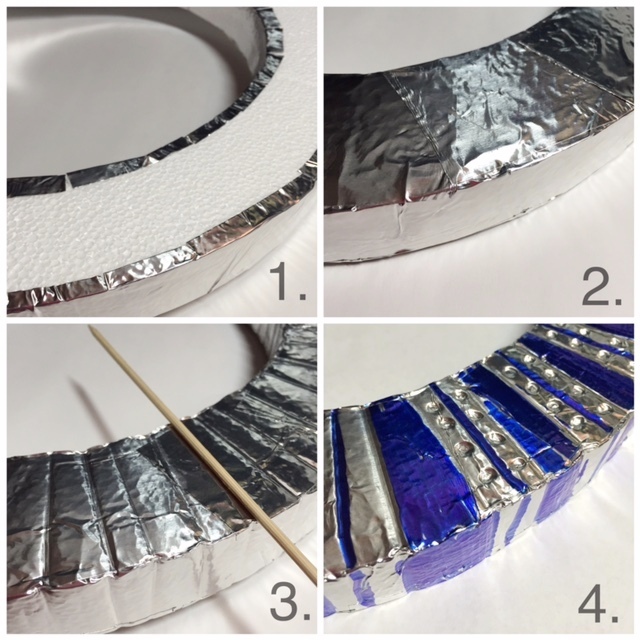 Cut the foil tape into 3″ pieces and cover the rest of the wreath. Smooth out any ridges with your fingers. 3. Use the bamboo skewer to press line indents onto the surface of the wreath. 4. 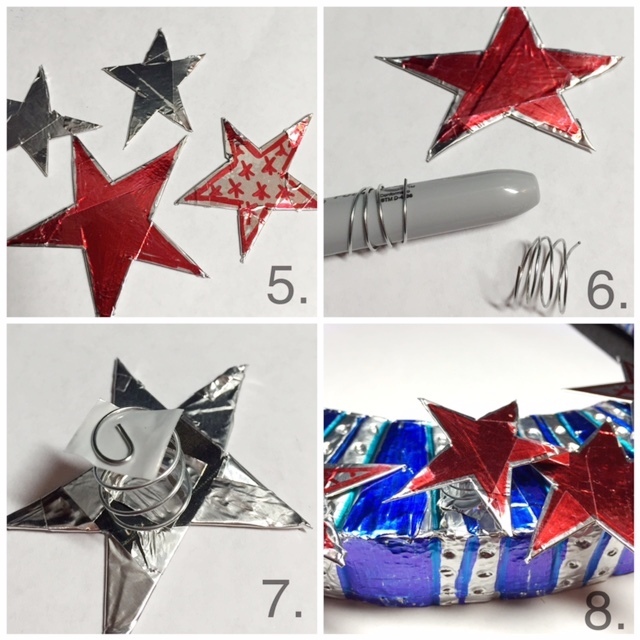 Add detail with the end of the paintbrush – be careful not to poke through the foil tape. Color with the pens. 5. Hand or die-cut 18-20 assorted sized stars from the cereal box. Cover stars with foil tape and trim off excess. You only need to cover one side of the star. 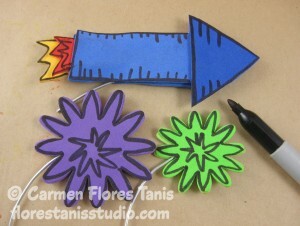 Decorate stars with the colored pens. 6. Measure 5″ of wire. Wrap it around a pen to make a coil. Make enough coils for every other star. 7. 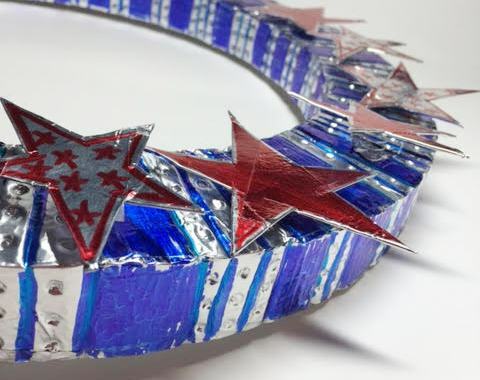 Use the foil tape to attach the coil to the backside of the stars and also the wreath. 8. Use the end of the paintbrush to maneuver through the coil, to help press the foil tape onto the wreath. 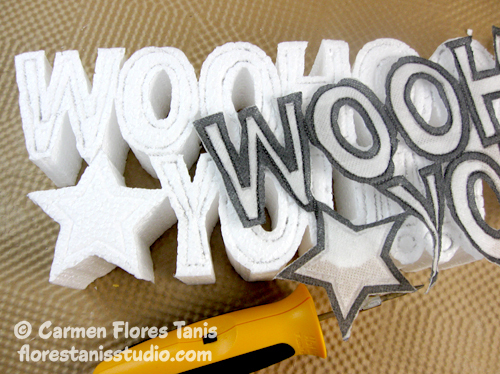 Attach the other stars with foam tape. Attach a loop of wire to the back of the wreath with the foil tape and hang it for all to enjoy! 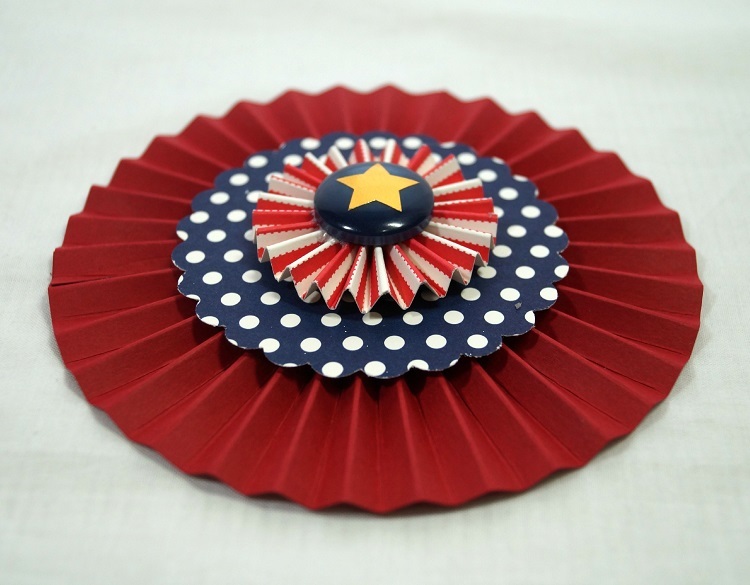 Celebrate Independence Day with this Party Table Topper! 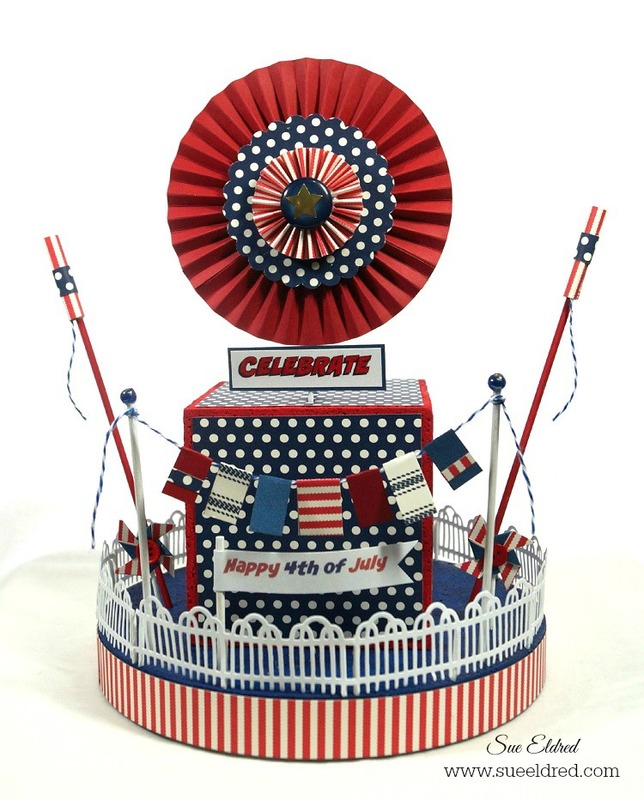 Summertime is prime time for parties and Independence Day fireworks, so here’s a cheery table topper that will help you celebrate your special occasion. 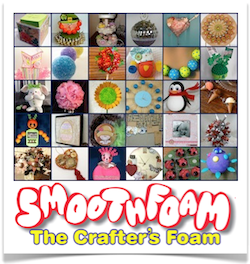 If you’ve never tried carving Smoothfoam, you’re going to love it! 1. Stack and glue the three Smoothfoam sheets together into a solid block as if you were making a sandwich. Press together well and let dry one hour. 2. Click here to download my original* artwork. 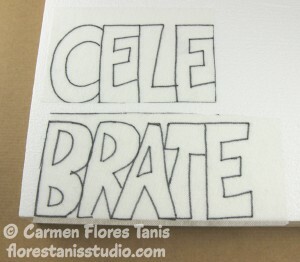 Because the word “Celebrate” is so long, I decided to break it into two parts and then join them together. Print the artwork onto the Sulky transfer sheet. Peel off the backing paper and press the sheet on the Smoothfoam block. 3. Poke pilot holes with the hot knife into each area of the block that will be cut out. Carefully carve out the design on the mini-scroll table. Unthread and re-insert the wire into each pilot hole to make each interior cut. Peel off the transfer sheet when finished. 4. Connect the two carvings with short pieces of toothpicks and glue. 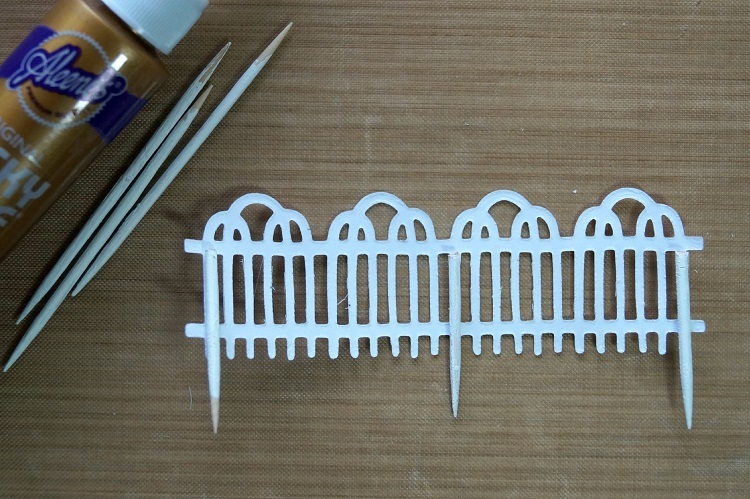 Use the wire cutters to cut the toothpicks. Press together firmly. Let dry fifteen minutes. 5. Tap the Sunshine ink pad on the front of the carving to color. Use a brush and some water to help spread the ink. 6. 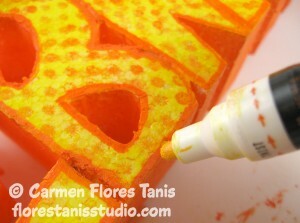 Apply Tangelo ink to the sides and back of the carving. 7. Stamp the dot pattern onto the carving with the Tangelo ink pad. 8. 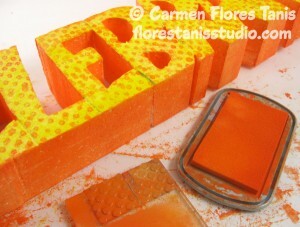 Outline each letter with orange paint pen. Let dry then outline each letter with black paint pen. 9. Cut a 6” and a 4” length of wire. Use the pliers to shape the top 2″ of each wire into large spirals. Set aside. 10. 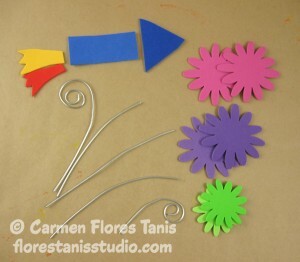 For the fireworks, cut out flower shapes from the craft foam. Cut a 4” length of wire and add a large loop to one end. Peel the release papers from two flower shapes and adhere the sticky sides together sandwiching the wire loop in between. The loop will help the foam shapes stay in place. Repeat to make three fireworks and the rocket. 11. 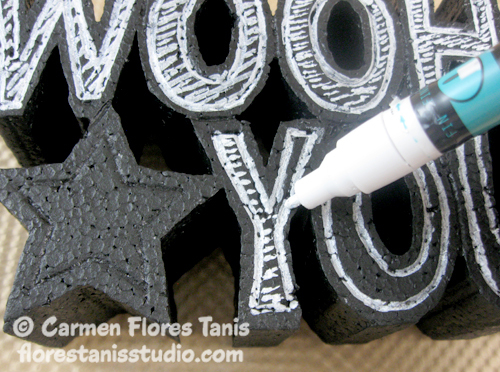 Add details to the foam shapes with black permanent marker. Poke the wire ends of the shapes and the spirals into the top of the Smoothfoam carving. Secure with glue. * You are welcome to use my original artwork only for your own use or for a gift/donation. You may not use my designs for items intended for resale.